YOU really have to feel sorry for the hire companies attempting to operate in this day and age on the waterways. For gone are those halcyon days when an hirer can be sent on his or her way with the hire company happy in the knowledge they will get to their destinations and be able to return, with no problems either for the hirer or the company having to rescue a boat. The failure now on the Middlewich Branch not only means that hirers from the companies that operate from the town can no longer get to their favourite Llangollen Canal or the Four Counties Ring, but the long delayed repair to the lock on the Marple Flight means they cannot cruise the Cheshire Ring either, as the repair is being dragged out until after Easter. With the closure of the Middlewich Branch will CaRT pull its fingers out and get the Marple Flight repair finished for Easter to give boaters a chance? What do you think? With around 20 boats stranded on the empty pound, what will be the solution to remove them? I can't see pumps being installed to fill the pound and keep it full so that the boats can remain, as this is the only way water can be fed into the pound. As there is no place where a crane can be used to lift them all out where they are resting it would seem the pound will have to be temporary filled to get them down through the lock onto the Trent & Mewrsey Canal. 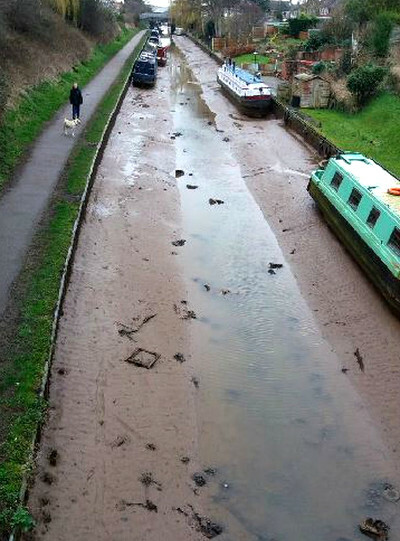 The failure of the Middlewich Branch is the first real failure in the tenure of the present Chief Executive Officer of the Canal & River Trust—and I wonder how he will cope. After all, with so much cash being spent on all his strange appointments of people concerned with so much that has little to do with the actual operation of the waterways and on other non boating activities, I wonder if this has effected the 'contingency fund' that was always held by the previous British Waterways for such major failures. My feelings, especially in view of the recent announcement of the sell-off of its marinas coupled with the massive loan taken out, are that that fund has long gone, and boaters will consequently suffer for a long long time before the Middlewich Branch is in operation again. Though others have stated it is the Wheelock Aqueduct that has failed, it is not, as this is still standing, the breach being adjacent to the structure and as such should not be such a massive job to repair. 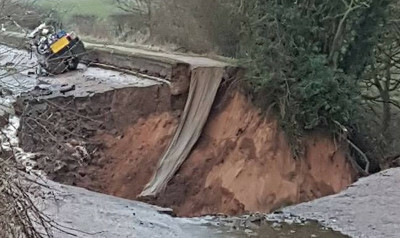 But bearing in mind it took 18 months to repair the breach at Dutton on the Trent & Mersey Canal—which failed again as the joining of the new to the old gave way, it doesn't say much for either the quality of contractors or a quick fix. Excuses will range from difficulty of access to total lack of funds, and we might even get an appeal as we did with the Dutton Breach, with that appeal stopped owing to the poor response—after all, many rightly though it should be the navigation authority that should pay, it being its responsibility. A big problem these days is lack of experience with such jobs, as these are now undertaken by contractors who of course have no understanding of such matters—the reason as I mentioned, the Dutton breach failed again. In the meantime many boaters will have to have to re-think their cruising plans this Easter, with two Rings firmly closed. And it will of course have an effect on the Middlewich Canal Festival. I only wish that CaRT would not continue to tell us that 'the embankment has failed', when all can see that the entire waterway has disappeared. But I expect we are now well used to its silly statements. You can feel for the lady who lost her young Alsatian—sorry, German Shepherd—in the Shropshire Union Canal, but it could be a warning to others, as I read that the dog had a woolly jumper to keep it warm, that of course quickly became sodden in the water and very heavy, perhaps too heavy for the young annimal. With another spate of flooding of the Trent now expected, it really is sensible to make sure your boat, moored at Sawley on the river is able to rise with the water, for the water in the marina rises indeed, with one well remembered instance way back in 2002 when they let the water out of the Lady Bower dam that took the water up at least three feet over the jetties. We were lucky as the then British Waterways had lock keepers and plenty of staff available to constantly monitor the boats to make sure non sank. The nearby Derby Motorboat Club wasn't so lucky as four sank, there being no one on hand to release those tied too securely. It is hard to believe but such was the deluge of water that three boats sank at the marina above Derwent Mouth Lock. Since then there has been other flooding when the water went over the jetties—here's a picture of the jetties well covered in the residents area just a few years ago, being well under water. Which brings me to the purpose of this—always make sure your boat can rise with the water when it floods. Last week, though the Trent was in flood, the water was still a couple of feet below the jetties, yet to our horror the boat sharing our jetty—and the one next to it—as can be seen, were clearly prevented from rising with any flood being securely tied to from the top of the 'runner' to their roofs. Meaning that should the water rise both would be firmly held then pushed over by the rising water and likely sink. Our concern was that the one we shared with would take ours with it, ours being completely free to rise, so we immediately contacted the office as it was dangerous. At one time before winter, the marina offered advice about allowing boats to rise in flooded conditions, but we have had nothing in recent years, with the result that those not realising the danger tie their boats far too securely.